To be honest I’m not always a fan of pink. 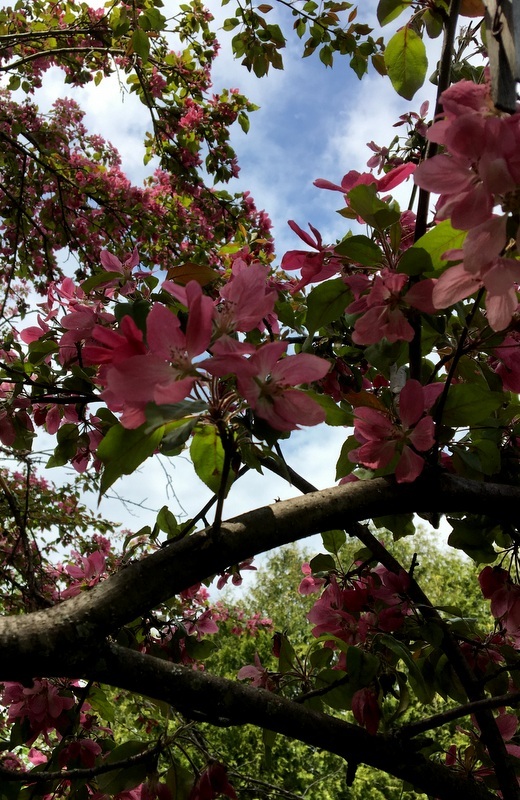 Of course, I love pink spring blossoms like the ones on our flowering crabapple tree below. I almost missed the blossoms this year because both this tree, and our other apple trees, bloomed while I was away down east. So, yeah, I love pink apple blossoms. And pink tulips; I love pink tulips. And hyacinths. And lilacs. But pink on me… as in true pink, pale pink, blush, or coral… blouses, scarves, or sweaters… not so much. It’s because of my colouring. I have my grandmother’s redhead complexion, without the red hair. I always thought I should look good in peaches, and soft pinks, but I just never did. Then I was told years ago by my hair stylist at the time that my colouring was that of a “cool redhead.” Meaning that the undertones in my skin are cool, blue-y tones. As opposed to warm, peachy tones. Huh. That made perfect sense. 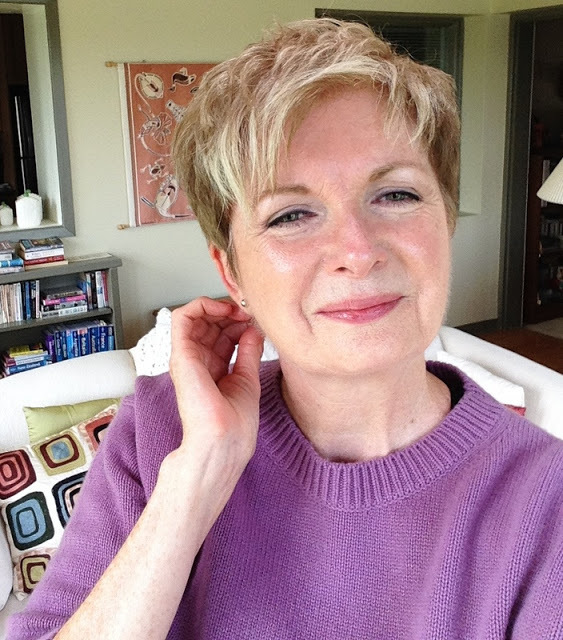 And explained why the new lovely, peachy sweater I had bought looked dreadful on me when I got it home, while my old burgundy sweatshirt made me feel like a million bucks. So I guess I can say that I don’t necessarily feel in the pink, when I’m in pink. But pink-ish. That I can do. As long as it’s a pink-ish with a blue-y undertone. Like this summer sweater from Vince that I bought a few weeks ago. I was looking for a sweater to go with my new black and white striped skirt. And I found this lilac (or is it violet?) cashmere crewneck pullover at Nordstrom. I love, love the colour. Especially with the black and white stripe. I can wear it over a short-sleeve black tee. Or just drape it around my shoulders, like this. The colour is lovely. And the shape is… well… perfect. Perfect to wear with this skirt. Loose enough to cover upper body lumps and bumps, without being too slouchy. Boxy enough that it skims my hips, but narrow enough that it doesn’t add bulk, or make me look bigger than I am. Sigh. The exact cut I was hoping to find when I began my journey to move on style-wise. Don’t you love it when that happens? I should mention that I tried it with the black tee shirt initially, but after a few minutes the sweater began to feel too bulky with the shirt under it. And I find I prefer the sweater on its own. The cashmere is really light. And soft. And not at all itchy. I checked out the Vince sweaters on-line at Nordstrom, and this one is 40% off. So, if you’re inclined to shop, here’s the link. I was kind of appalled at the way Nordstrom has the sweater styled on its website. I’d never have bought it if I hadn’t seen it in real life. Mine is a size small by the way. And I am most definitely NOT a size small, so beware. Hands in my pockets, feeling soooo comfortable in this outfit. After my mini-fashion show, yesterday, I was heading out to do some shopping. Not clothes shopping, I should add… I have spent my limit for spring. Just errand running. And since I would be in and out of the car a lot, I thought pants would be a better choice than my skirt. 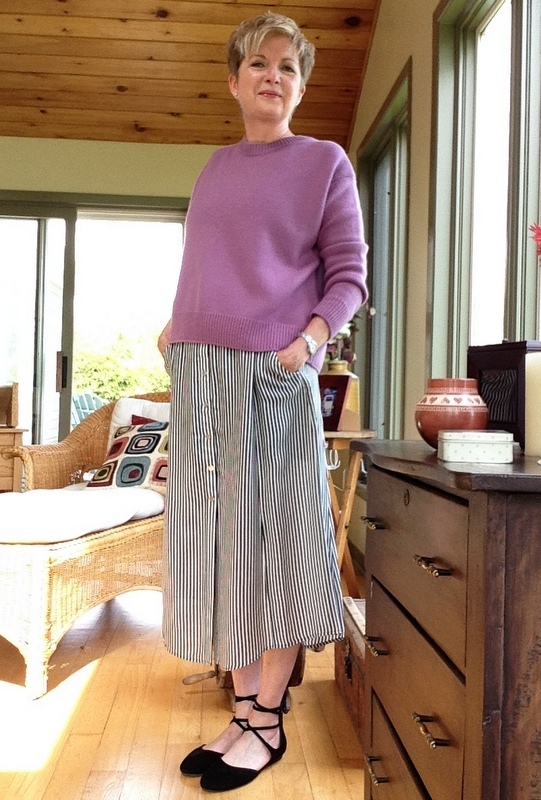 I like these black Rag and Bone cropped pants with my new pink-ish sweater. It’s the high waist that clinches the deal, I think. And despite not liking the black tee under the sweater, I still wanted a touch of black around the neck. So I opted for my black racer-back sports bra. Now, I don’t normally use my bra straps to accessorize. Ha. But… in this case… I thought the glimpse of black strap looked kind of good. Now, a word about these black, suede Paul Green flats. I can tell already that they are going to get out and about a lot this summer. If I can just figure out how to keep the black laces from dying my ankles black. Anyone have any ideas about that? So, off I went yesterday. Most definitely feeling in the pink, as well as being in pink. Or pink-ish. Or lilac, if you prefer. I’d been looking everywhere for blooming lilac trees for days, whenever I was out driving around, to no avail. 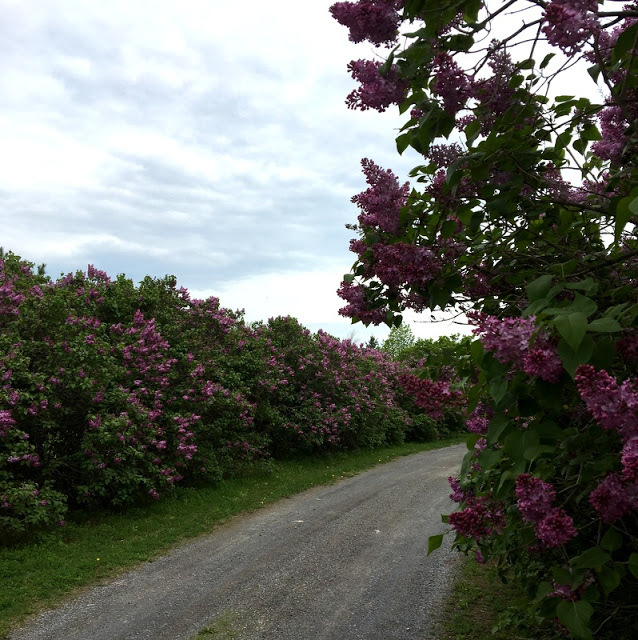 Then on my way home… I drove past this lovely lane of lilac trees. Just the perfect colour to match my new perfect sweater. Huh. A serendipitous day all around. This lovely lane of lilacs is just up the road from us. And speaking of serendipitous, Hubby just came into the den to tell me that it was a very good thing I got all my blossom shots when I did. Because they are long gone now. And sure enough when I looked out my window, I saw that the lashing rain and strong winds had made quick work of most of the remaining apple blossoms. But the pink tulips are hanging in there. I love tulips. Especially pink ones. So that’s one good thing about a cool spring, folks. More time to look at the tulips. Even if we’re not tiptoeing through them. Ha. Anyone else remember Tiny Tim? Gad. Now I’m going to have that song and his warbling voice in my head for the rest of the day. So, how about you my friends? What are your views on pink. Or pink-ish? Does wearing it make you feel “in the pink?” Any colours that you can’t abide? I've got the same coloring, this sweater is a stunning shade! I agree with you totally. The styling on that sweater at Nordstrom's was ridiculous! I love this whole look on you. Very chic French countryside. Hi Sue, when I was younger, lilac, just like your jumper, was my favourite colour for EVERYTHING. 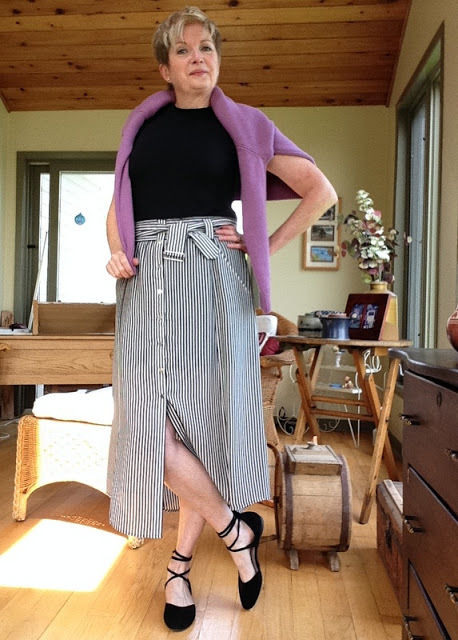 Now, however, my favourite to wear is a periwinkle blue – as the years went by I found that the lilac kind of washed me out and I need something a bit deeper and brighter. 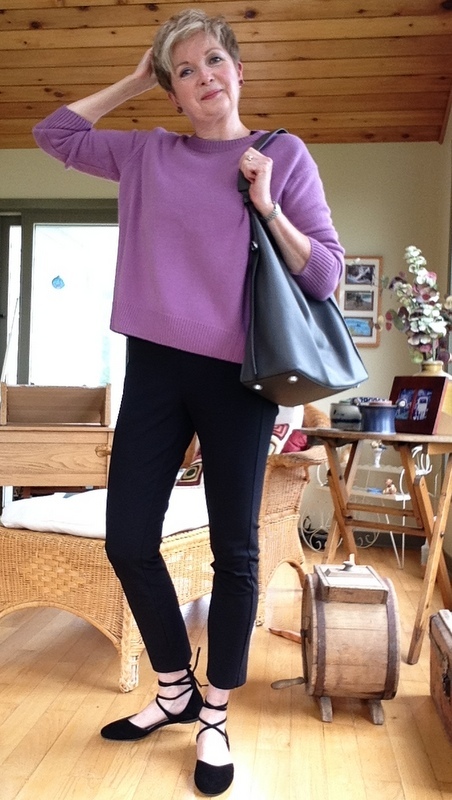 I must say, I love the sweater with the black trousers and lace-up shoes – it's a little bit Audrey Hepburn, very chic. 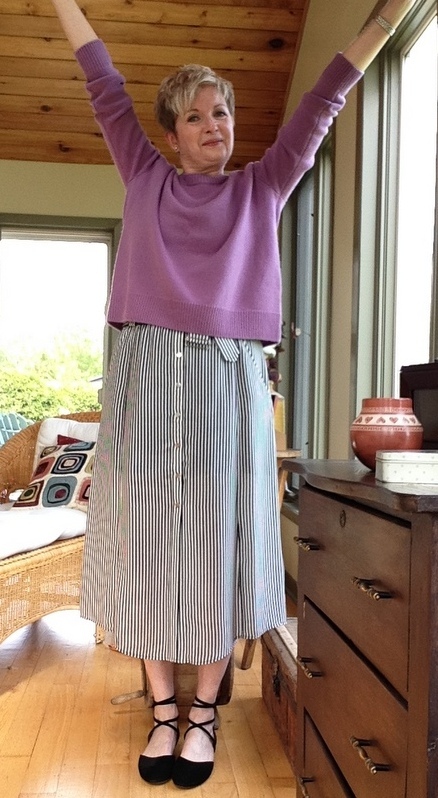 Oh… I love periwinkle blue as well, Patricia. Must be the purple-y undertones. I seem to have the same colouring as you , except I have lots of the red head freckles – & more wrinkles 🙁 . I've never been happy in pinks but do like the more bluey toned pinks . Your new jumper is a lovely colour . Can't advise how to avoid the black ankle stripes though . Very naughty that good shoes do this , especially when you love them . My redhead freckles seem to have faded over the years. I used to have lots of them. Maybe I just traded them in for wrinkles. Ha. That is a beautiful color! And I love the skirt too! Hi Sue, you look lovely in the pink! I laughed reading about your lumps and bumps, you can't have any of those surely? I can't see them! Like you I can't do that soft blushy colour, it drains my skin of all colour. Bluey pink is a must for me too. I'm going to a wedding next week and will probably wear my old silk dress which is hot pinks and mauves. I'm trying to tone it down a bit with non-pink accessories as I usually end up top to toe pink. A bit OTT! Sorry, don't have any tie shoes, I have enough trouble with buckles these days and usually get hubby to shoe me up! Thanks, Mary. Don't be fooled by the artfully draped tops… there are lots of bumps and rolls there. Just all above the waist. You look super in both looks and the jumper shape and colour is fab on you. Funny, I always thought of pink as a cool colour. Being warm I avoided it but recently I am finding warm pinks available. So you may find cool pinks yet. Let's hear it for cool pinks…those are the only ones I can wear. But they have to be saturated…no faded pastels…or I look ill…and ten years older. Those are some great looks today! I especially love the way you're wearing that skirt. I've been wearing my below-knee full-ish skirt in the heat here and wishing I had one in a more travel-friendly colour (mine is white! I know!). . . might have to do a little shopping, right? Thanks, Frances. I think skirt shopping is required in your case. Bet you can find some lovely skirts where you are. Wink, wink, knowing look. knowing look. It is lovely and you look great! Perfect choice. So many pinks just wash me out.. but lilac as long as it's a strong shade and not too pale, I love. Pink. Hmm. I used to loathe it (too many weddings in the 80s) and I still cannot abide peach (same reason) but I do rather like it now. I have had a couple of lovely pink items but I like either shocking pink or the palest blossom. The key I believe is to have just one item, not a theme as that is very tragic on a woman, as if she is determined to be Blanche DuBois. Lilac. Now you are talking. I'd never leave that lane. Peach is my nemesis colour. Makes me look all faded… ala Blanche Dubois. You look great in both outfits. The sweater colour is lovely and a very nice shape on you. That is annoying that the laces transfer some dye onto your skin. Hopefully that will stop after some wear! Thanks, Suz. I'm hoping the guys at the shoe store where I bought them can help me. Otherwise I look like my ankles are bruised by the end of the day. Whatever you call that colour, it definitely pops on you! Wind and rain brought down more than blossoms at our house. Hubby has just finished cutting up two trees that came down the night before last! What a spring we've been having! Oh wow… hope they didn't do any damage. We had our giant Manitoba maple tree that overhung our sun room cut down last year. It shed one giant limb the year before…the one away from the house…so we knew the writing was on the wall. Just didn't want it on the roof…haha. What a fab look! I can't wear pale pink either, but hot pink is good on me. And I can't wear lavender, but it looks great on you! Thanks so much for sharing with Fun Fashion Friday! Have a wonderful holiday weekend! Thanks, Dawn Lucy. Happy long weekend to you. Our long weekend was last week. Queen Victoria's birthday. But hey… being retired…I'm luck to even recognize that there is something called a weekend. Hope my IG reply helped. Let me know about the sweater once you get it. Lovely photo's. That sweater colour and style really suit you. Alas, I have no shoulders to speak of so won't be ordering it. Nordstrom's is trying to speak to the less mature methinks. I can't wear pink unless there's some brown in it as My colouring likes warmer tones. So navy and black make look like death. Great blog post and IG pic's. Weather is #%@& here in the GTA too. Thanks, Susan. Funny how certain colours can totally change how we look. And make or break our day as a result! Thanks, Rosie. I remember that sweater of yours. Looks lovely on you. And they are quite similar. Although my sweater looks best on its own. I tried it with a blouse and then a tee peeping out underneath and didn't like the effect. Maybe a loose tank like my black one will work…just that if it's long there will be about a foot of the underpinning showing. I will probably play around with it in the days to come, though. And I'll keep that suggestion in mind. Such a shame about the ties on your shoes.I hope the shop can help you. I can't think of any obvious solution. I have a pair I bought a couple of years ago …similar style but the ties are fabric and doesn't stain my ankles. Are yours fabric or leather? I know! So frustrating! Makes me look bruised around the ankles. The straps are suede. I'm hoping that it's just extra dye that will wear off eventually. Ha… dead salmon in salmon. Good one, Patti. Love that sweater and it happens to look great (IMO) with olive green, if you have pants that color. It would look great with olive green… you're right. Thanks for showing me the sweater! I may have purchased it, and you're right, I never would have noticed it based on the website photos. It's so cozy! Hope you enjoy the sweater, Teresa. Spring certainly has sprung… Enjoy ! Love this color against your complexion! Brightens your face in a great way…cute look with the skirt too. Thanks, Pam. I have to keep reminding myself to wear more colour. I love your sweater, skirt and shoes! Beautiful color! I do like pink and purple and wear both colors often. Always enjoy your style posts.